5 Licenses only 510$US ! 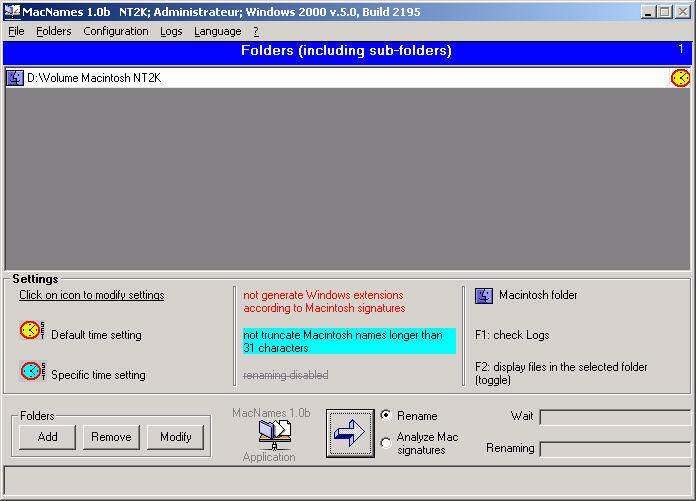 Software solution to automatically rename Macintosh files removing illegal characters and adding the three characters extension to filenames on a Windows NT, 2000 or XP Server to facilitate file types detection and use on Windows machines. 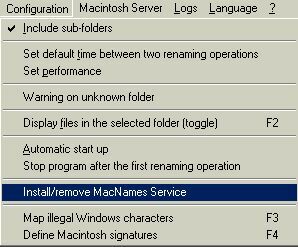 MacNames helps you in Windows-Macintosh cross-platform integration adding Macintosh extensions to win 2000 server in particular migrating documents from Macintosh to Windows NT/2000, renaming multiple files to remove trailing periods and forward slashes. There are many applications allowing to rename filenames for cross-platform purpose. All are Macintosh applications. MacNames is probably the only Windows NT/Windows 2000/Windows XP name cleaner software that lets you quickly prepare files created in Macintosh and stored on a WinNT , Windows 2000 or Windows XP Server volume for use in a Windows computer as well as shortening Windows long file names for use by a Macintosh. Windows NT does not like to have a "." (period) at the end of a file name and can't access files with "/" (forward slash) anywhere in the file name. If you liked to put dates in filenames on Macintosh side, changing it manually would be a big task that MacNames can automatically deal with during migration of Word, Excel and other documents to Windows .Your file names will rapidly be cleaned. when used as a Windows NT or 2000 or XP Service renaming files with illegal file names it increases productivity and is part of administrators toolkit focused on cross-platform needs. Some characters like /, \, <, >, ?, etc. are allowed in Macintosh filenames but are illegal for most Windows applications. In addition, Macintosh files do not need any extensions. A Quark XPress document named Advert 2003/01/11 - an usual name in Macintosh world - is not easily handled by Windows applications. Moreover this document has no icon and cannot be opened using double-click under PCs. MacNames renames it automatically in Advert 2003-01-11.qxd mapping slashes to dashes (for example) and adding the qxd extension which is specific to Quark XPress documents. The renamed document is then usable by Windows applications, gets its Windows icon and can be opened using a double-click. So you can use it to convert Quark Macintosh filenames to windows. Supports Microsoft Services for Macintosh (MacFile), Cyan Software MacServerIP or Group Logic ExtremeZ-IP . Option to include sub-folders in renaming processes. Mapping of illegal characters ( /, \, <, >, ?, *, etc.) can be easily modified and will be used by the program to find and replace characters that are correct on Mac platforms but not allowed on Windows machines. Can truncate windows filenames longer than 31 characters , allowing to view these files from Macintosh more friendly than DOS shortnames (8+3). Can analyze batches of Macintosh files signatures in selected folders. Stores in Log files the list of files renamed. When a folder becomes unknown (folder removed or renamed, lack a connection with a file server, etc. ), MacNames can send different kind of warnings: beep, display message, send a message to an administrator, messages in the Log, messages in the Applications EventLog (when MacNames is running as a Windows NT service). Useful for NT migration and in prepress environnement for files bulk rename and to automatically add windows extension to mac files. Evaluation version is complete but needs a registration key to be fully operational if you decide to keep it. With demo download you will be able to process three folders, get a reminder message after renaming processes. Other cross-platform integration products , converters Mac to PC or tools for automated tasks: MacExplorer, MacInfoTip, MacVolumes. Idem - automatic folder synchronization and data replication service for Windows directories including Mac volume,. Rarissimo - compressing files with streams for ftp send/receive, utilities for PC-MAC files management. Kalimages - image database with edit and search capabilities on desciptions and other IPTC annotations and Kalimages PRO the professional image companion too.